In case you don’t know about the “Hitler Hears” series of videos, let us fill you in. 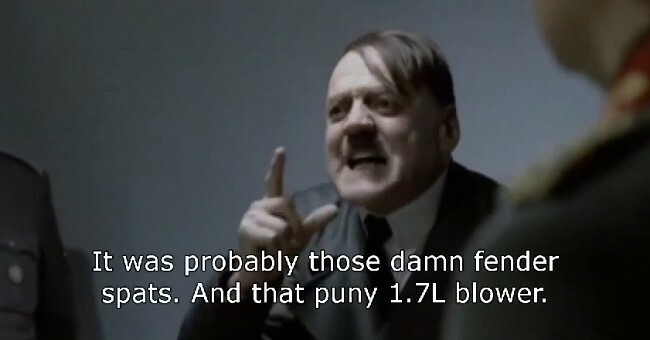 A clip of Hitler getting angry in a Berlin bunker, taken from the 2004 WWII movie Downfall, has been consistently circulated online with different English subtitles in order to change what it is Hitler is angry about. In the movie he’s angered over the inevitable collapse of his regime, but online he might be angry over the Breaking Bad finale or finding out Santa isn’t real. The latest bit of news which upset Hitler were the results of the 2015 Corvette Z06 and 2014 Viper TA roll race video we shared earlier this week. He had just taken delivery of his new Corvette and was delighted to hear about the robust dyno numbers, but got pretty angry when his high ranking officers informed him of the Z06’s defeat to its rival from Dodge. We’re sure the Viper TA and the Z06 will face-off in a comparison test on a racetrack, so maybe Hitler, and Corvette fans everywhere, will be happier with those results. There’s also the possibility of the eight-speed automatic Z06 putting up a better fight against the Viper, but as you’ll in the video below, Hitler is tired of excuses and just wishes his Z06 was a bit faster from the factory. Let’s hope he can enjoy the incredible performance of the Z06 anyways and not get too hung up over, to quote, “some old all motor Dodge,” being faster in the straights. Nothing really matters until they get in the ring! Chancellor Hitler this is more proof that it is all part of a worldwide zionist/Mopar conspiracy. Well Hitler, it appears as though GM dropped the ball with their engineering of the ECM! The power loss is substantial! And removing this module voids the warranty. If you ask me I’d say it sounds like GM isn’t confident in the longevity of the engine, and would rather provide reasoning to void the warranty by having customers get the ECU reflashed. This probably also explains the subpar trap speed and top-end acceleration. Tsk Tsk GM. I thought your engineers were wiser than this……. Ok for all the stupid people that think a stock viper can walk away from a Z06 like that… If you believe that .. Then you must believe in the tooth fairy … Hellcat fans must be tired of just doing burn outs, because that’s the only fun you can have, you can’t take that 707hp whale on the track, stop light to stop light racing died out just like the sales of the Viper..so now you have to make fake videos to try to boost sales, sorry… everyone knows Z06 has better options and best on bang for buck..! !